Put onion, carrots, potatoes, bullion cubes, rice and water in pot, bring to boil. Reduce heat, cover and simmer for 30-45 minutes, or until carrots are cooked. Add ham, spices, 1 1/2 cups milk, then mix corn starch in last 1/2 cup of milk and add that too. Turn heat up, and bring to a boil, then cover and reduce heat to simmer for another 15 minutes. 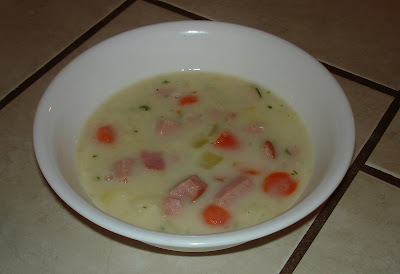 Jared's grandma makes a version of this soup called Grencole (spelling?) He grew up with it and it's one of his favorite things. I once asked her for the recipe but she said she didn't have one (she cooks like me, just adding things as needed) this is my adapted version. If any of you have a different version, let me know I would love to try it.